Hotel fixer Anthony Melchiorri, star of Travel Channel’s “Hotel Impossible,” comes to the rescue of the Maui Sunseeker LGBT Resort. The episode featuring the transformation of the resort, its first resort property in the beautiful state of Hawaii, premieres on December 17 at 10:00pm on Travel Channel. 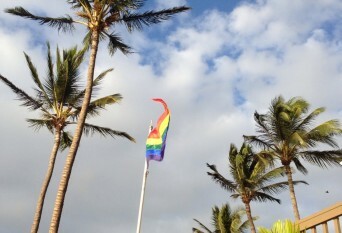 An adults-only property, the Maui Sunseeker welcomes all, but caters to LGBT clientele. With such a narrow client focus, Melchiorri works with Chuck Spence, Owner of the Maui Sunseeker, on the marketing strategy and allocation of resources to improve the property. Posted December 5th, 2012 & filed under Travel.